W.C. Fields famously once said "Never work with children and animals", but that didn't deter Detlev Buck from trying his hand at a "children's western" with an adaptation of the novel Haende weg von Mississippi by Germany's answer to J.K. Rowling, Cornelia Funke. As producer Claus Boje stresses, the decision to make a children's film was "not based on any strategic consideration just because family films are doing so well at the moment. It is rather the case that one is interested in a story, the characters and the atmosphere. It is a challenge to do something new where one is looking at the world from a different perspective, from a child's point of view. That's why one does it." The film was shot completely on location north of Berlin around the Schaalsee in Mecklenburg-Vorpommern during this summer's heat wave in July and August. "Working with children was quite a new experience," Boje admits. "It is psychologically a different kind of work. The thing was that we were working with both children and animals – with horses, pigs, ducks and they are definitely not like trained actors!" 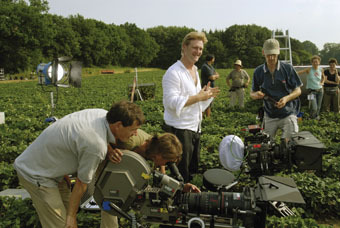 The production also marked the first collaboration with the young DoP Jana Marsik whose work on shorts and documentaries had come to the attention of the producer and director. "Straightaway, she had the right approach to the subject," Boje recalls. "She understood that it is a film about the summer holidays and the fact that they should never end. She managed to translate this flair of adventure and freedom into images." Meanwhile, the cooperation with the local authorities and the people in the region ran so smoothly that Boje Buck would not hesitate to return to Roegnitz and the Schaalsee in the future. The local press even announced that the production company would open a branch office there. "We will definitely see if we can find something where we can come back next year," Boje says.